Are you planning a family reunion? Have you thought about having a presentation from a genealogist on one of your ancestors? Your family will be intrigued to learn of the exploits of their ancestor. A slide show with photographs, maps and original documents can illustrate the life of an ancestor and bring that person to life for your family to enjoy. 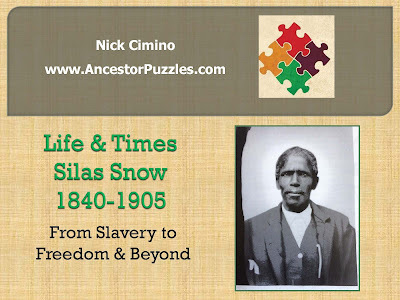 Silas Snow was born near Spay, Choctaw County, Mississippi in 1840 and died in Falls County, Texas in 1905. He migrated to Texas with his slave owner between 1850 and 1860. He registered to vote in Hamilton County, Texas in 1867. He owned 173 acres in Coryell County and some of the land is still in the possession of one of his descendants. 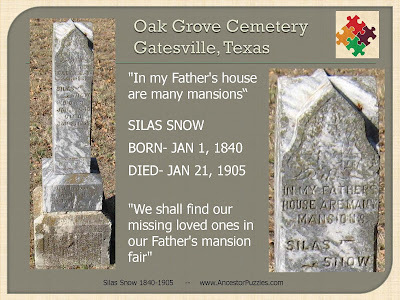 Silas Snow has a substantial headstone in the Oak Grove Cemetery near Gatesville, Texas. The inscription and the carving on the headstone are reflective of his faith in God and his belief in a family reunion in heaven. The gravestone gives his exact dates of birth and death. This gravestone photo was obtained from his FindaGrave Memorial. 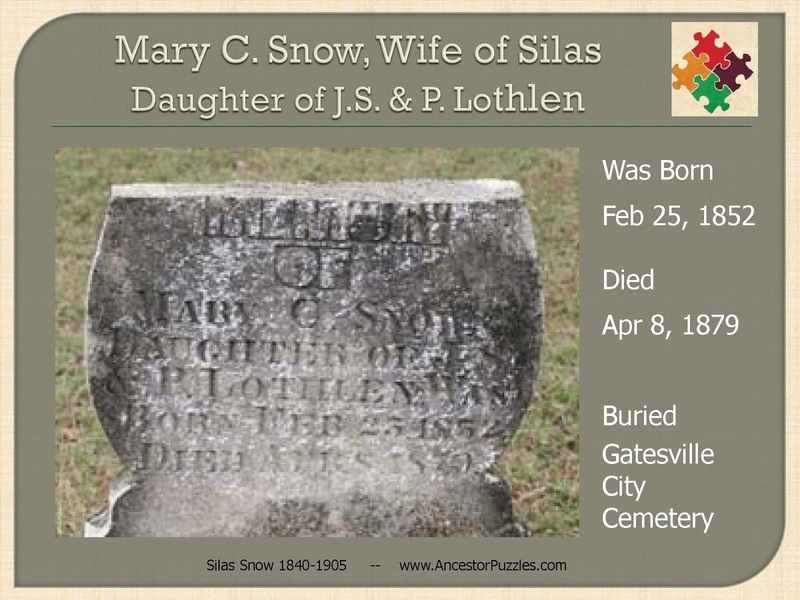 Silas Snow married Mary Caroline Lothlen on March 5, 1872, in Coryell County, Texas. They had five children during their marriage: Radford Snow 1868-? ; David H. Snow 1872-1945; Ollie Snow Mack Mayberry 1873-1947; Lula Snow Armstrong Comer 1876-1935; Mary E. Snow Wallace 1877-? 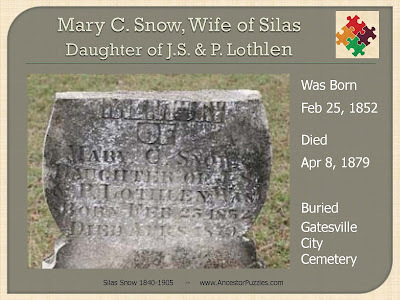 His wife Mary Caroline Lothlen passed away on April 8, 1879, in Coryell County, Texas, at the age of 27. They had been married 7 years. She was buried in the Gatesville City Cemetery in Gatesville, Texas. 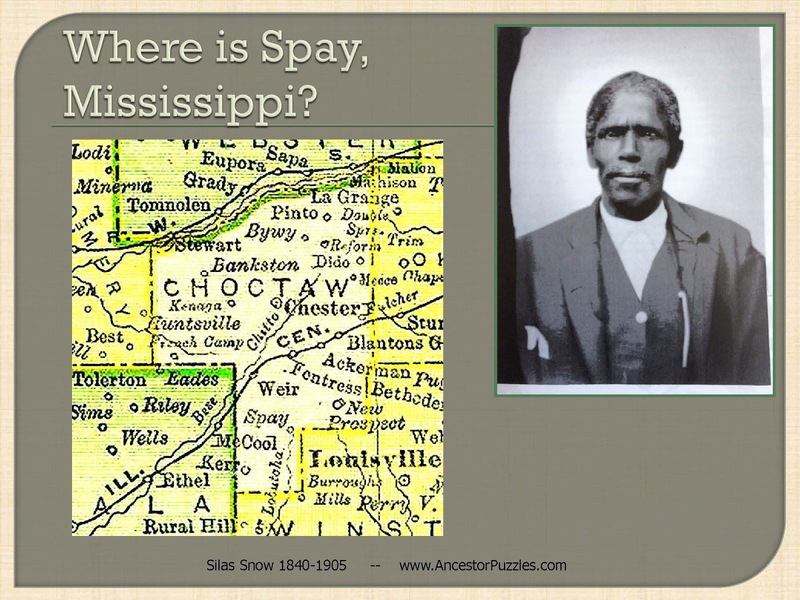 The family had oral history that Silas Snow was born in Spay, Mississippi. I was able to find this 1895 map of Choctaw County, Missipppi that shows Spay located in the southern part of the county. 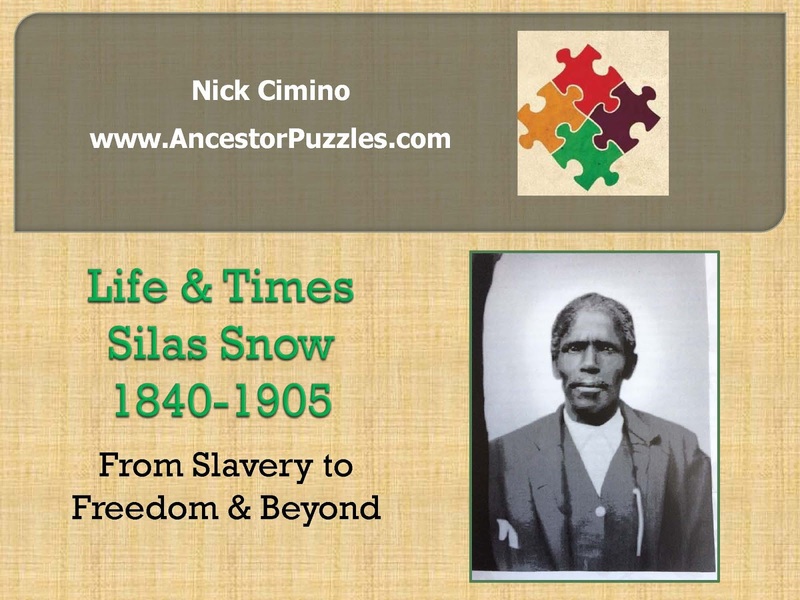 Silas may be the 10 year old unnamed slave of Eli Snow 1780-1851. Eli Snow was the father of David Crockett Snow 1817-1877. D.C. Snow married Nancy Barron 1817-1907. D.C. and Nancy were married in 1838 in Choctaw County, Mississippi. 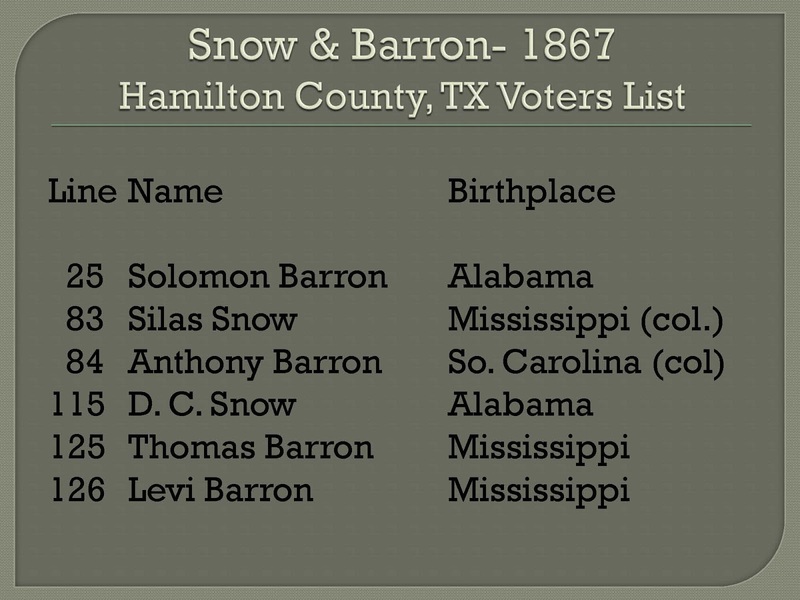 Many of the Snow and Barron family members migrated with their slaves from Choctaw County, Mississippi to Hamilton County, Texas in the 1850s. Silas Snow registered to vote in Hamilton County, Texas in 1867. D.C. Snow was the only man named Snow who owned slaves in the 1860 slave schedule of Hamilton County, Texas and is also the only white man named Snow who registered to vote in 1867. 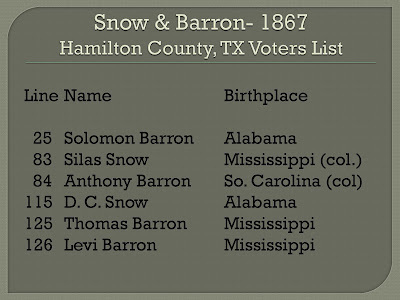 It appears that Silas Snow and Anthony Barron came to register at the same time as they are listed next to each other on the voter register. 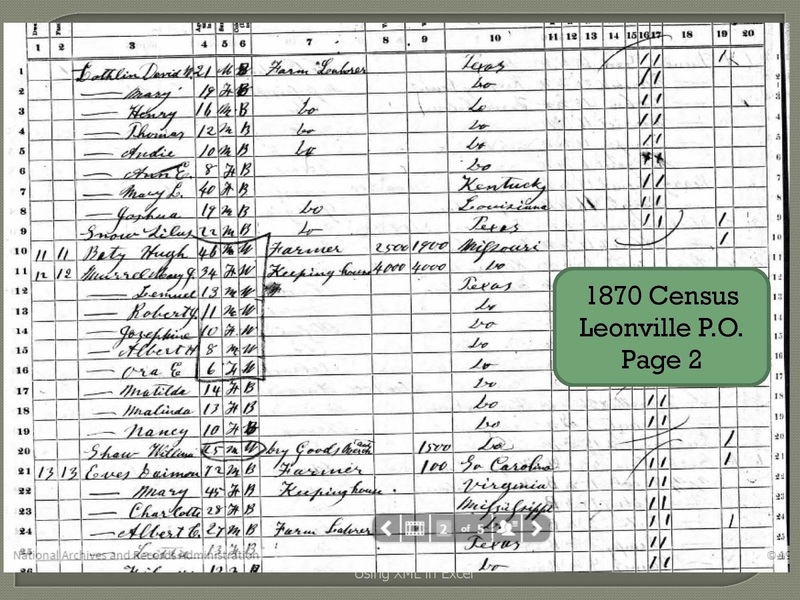 The 1870 census neighborhood near the Leonville Post Office in Coryell County, Texas tells a tale of relationship between white and black families. Jack P. Key was one of the largest property owners. He later becomes a Texas legislator. The Barns family in the next household headed by Rose Barns and her oldest son, Jacob was one of the keys to unlocking the mystery of this neighborhood. Jacob Barns is also know as Jake Barrens. Jake told his life story to the WPA in a "Texas Slave Narrative." At the bottom of the page is John Loflin also known as John Lothlen or Lothlin. In fact when you look at the page that follows you will see that his children were enumerated with the surname Lothlin. Silas Snow was residing in the Lothlen household and he is enumerated on line 9 of the above census page. His future wife, Mary C. Lothlen is on line 2. We believe that the Lothlen family were the freed slaves of Dr. A.Y. Lothlen. 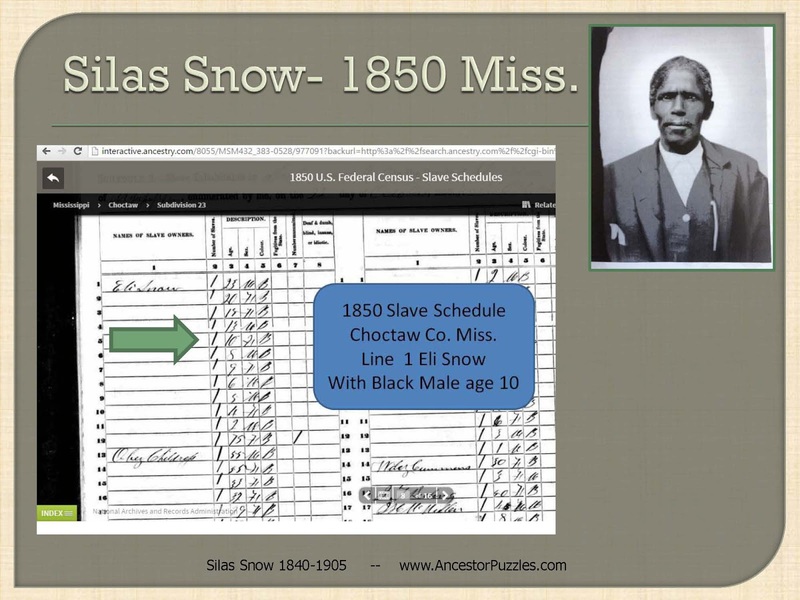 Silas Snow received 100 acres from Dr. A.Y. Lothlen in 1878. The former slaves owned by the Snow and Barron families had to leave Hamilton County and search for work in nearby Coryell County. 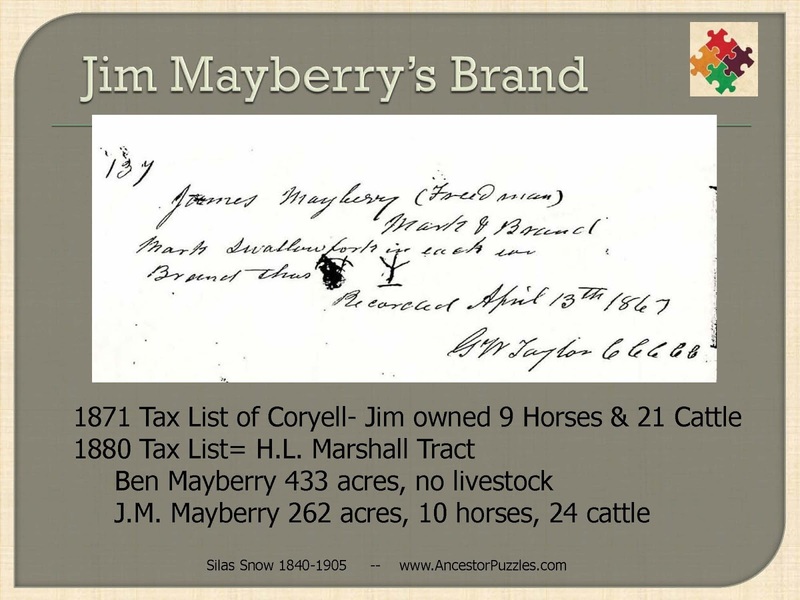 The leaders of Coryell County followed the example of Judge Mayberry by encouraging the freed slaves to live in a "freedom settlement" called Lincolnville. Read more about Lincolnville in this online newspaper article. A Snow descendant owns a substantial portion of the land near the site of Lincolnville. The white Murrell family have oral history that ties them to the black Snow family which has been documented in Coryell County history books. The oral history is substantiated by the fact that they are living in close proximity in the 1870 census. The Coryell county biography for Lemuel Murrell says that some of the Murrell slaves took the name Murrell and gave the slaves land near Ireland. While this was written up in a Coryell County History, it appears to be based on undocumented oral history. Silas Snow received 100 acres from Dr. A.Y. 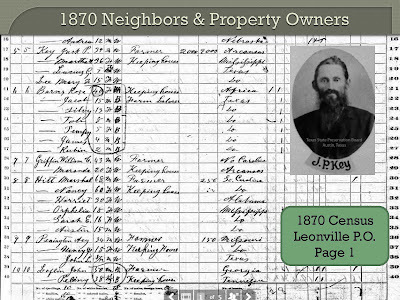 Lothlen in 1878 not Lemuel Murrell. The land of Silas Snow was near the future site of Ireland in the Spencer Rice Survey. Did the Murrell family help Silas Snow acquire this land from their former neighbor, Dr. A.Y. "Sandy" Lothlen? Perhaps a copy of the deed from Lothlen to Snow would shed more light on this question. This story also says that many of Lemuel's slaves stayed with him and took the name Murrell. 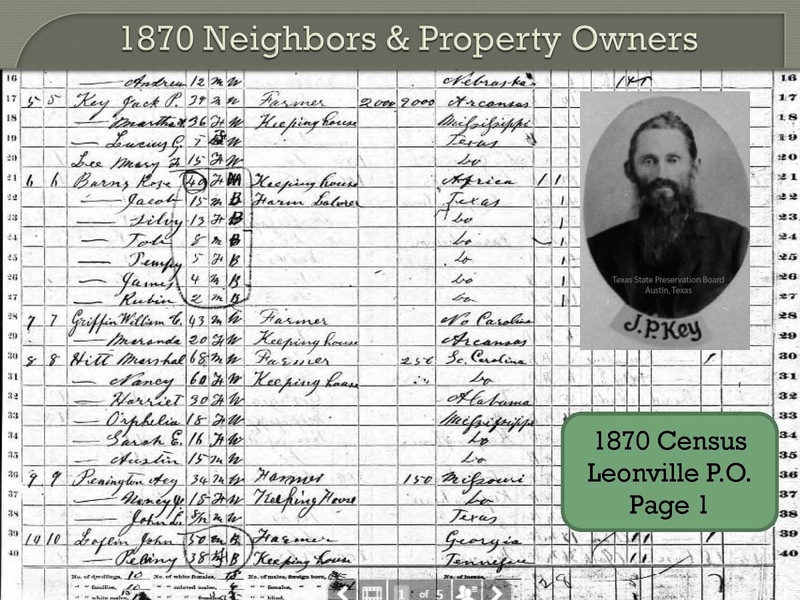 However, in reviewing the five 1870 census pages which show the community near the Leonville Post Office, there are no black families named Murrell. Thomas Lothlen (Loflin) and Silas Snow are shown near the widow Murrell on page 1 and 2. The oral history leads me to believe that Silas Snow and the Lothlen family were working for the Murrells. Jake Barrens is on page 1 with his mother and siblings. The Barrens appear to be working for Jack Key which is substantiated by Jake Barrens slave narrative. On page 2 immediately next to Mary J. Murrell, the widow of Lemuel Murrell, are the black families headed by Daimon Eves and Dan McCowan. These may be the former Murrell slaves but more research is needed to substantiate that relationship. 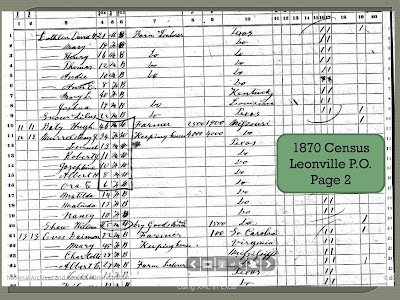 All of the families on page 3, 4 and 5 of the 1870 census for the Leonville Enumeration District are white. Mary J. Murrell is living next door to her brother, Hugh Baty 1824-1871 and they are both substantial land owners. Another fact that supports a relationship between the Snow and the Murrell families is that one of the Snow descendants had pictures of members of the Murrell family that had been passed down in the family. However, it would appear that more research is needed to prove that Lemuel Murrell gave land to any of his slaves. 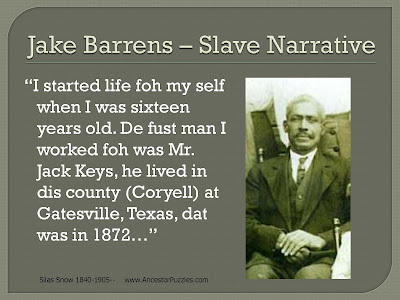 The slave narrative of Jake Barrens links him to the 1870 census neighborhood where Jack Keys was living. The slave narrative of Jake Barrens is also posted to his FindaGrave Memorial which has more pictures and links to his very accomplished children. 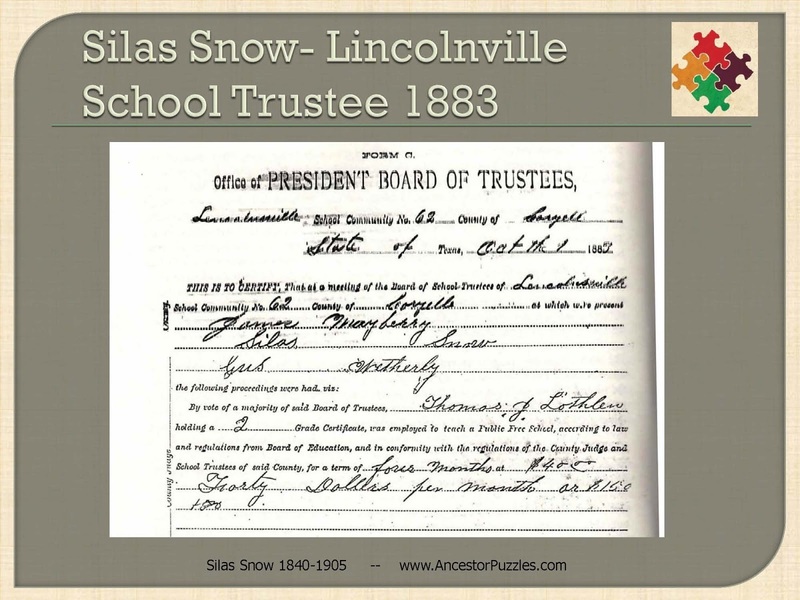 By 1883 Silas Snow was one of the trustees of the Lincolnville School. 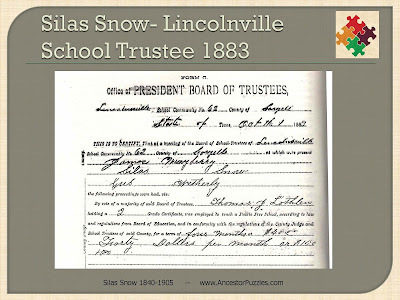 This document shows that the school trustees hired the brother-in-law of Silas Snow, Thomas J. Lothlen, as a teacher. The other trustees are James Mayberry and Gus Wetherly. 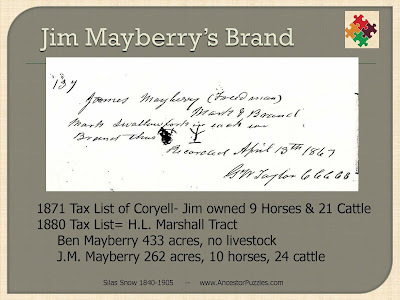 This image from the Coryell county brand book shows that James "Big Jim" Mayberry recorded his mark and brand on April 13th 1867. The registration record shows his name as "James Mayberry (Freedman)." His mark was a swallow in each ear and there is a diagram of his brand which looks like a Y over an upside down T.
This slideshow is an example of the kind of presentation that I can prepare for your family reunion. Thanks to Geri Hoover of San Antonio, Texas for inspiring and sponsoring this fascinating research project. accounted for the majority of his holdings (in excess of 57%). 1846-1880, abstracted by Andrew L. Leath, published by the Jack T.